Published by Cedric Benetti on Friday, May 18, 2007 at 5/18/2007 04:23:00 PM. 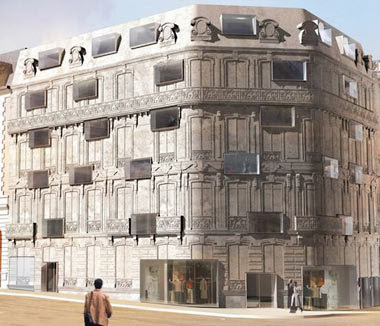 The new Fouquet's Barrière hotel building by french architect Edouard François is giving coherence to this block of 7 buildings from different styles: 2 haussmannian ones mixing with 2 recopied hausmannian style facades. François invented this new concept called "moulé-troué": a fake hausmannian wall made of concrete blocks and put on the ancient 1970s building structure underneath it. This luxury hotel boosts 107 rooms (55 suites) with interiors by reknown interior designer Jacques Garcia. 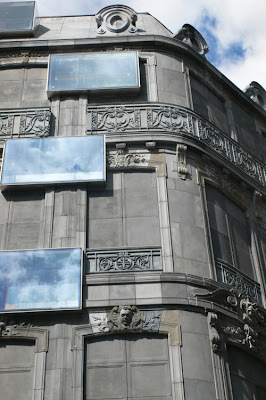 The architectural project cost 50 million euros. 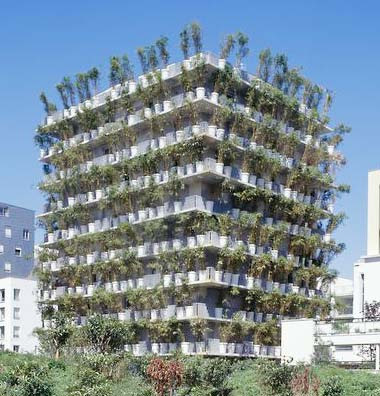 Edouard François is well known for his ‘tower flower’ in Paris, built in 1999; a residential building disguised in bamboo trees.